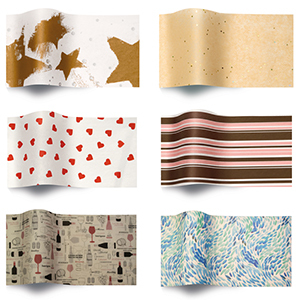 American Retail Supply offers hundreds of printed tissue paper designs and styles for gift shops, apparel stores, jewelry stores, restaurant or bakeries or most types of retail stores. The printed tissue paper are available in precious metal colors and designs of gold, silver or combination of both to give you elegant look printed tissue paper. Some of the popular designs are 2 sided tiara gold/ gold pattern tissue paper, copper color tissue paper, gold swirls on kraft tissue paper, gold stars on white tissue paper and many more. These printed tissue paper are perfect for wedding celebrations, or any occasion that has theme of gold, silver or copper colors. Most of these tissue papers come in packs of 200 sheets. It is one of its kind, most elegant looking tissue paper perfect for packing precious gifts or jewelry. Some of the popular designs for sparkling tissue paper are diamond colored, ruby colored, aqua colored, red christmas colored sparkling tissue paper and many more. Most of these tissue paper comes in size of 20" x 30" and packs of 200 sheets per pack. The designs of these classic all occasion printed tissue paper can be used for any and all types of occasions, whether it be birthday party, holiday gifts, valentine or wedding. Some of the most popular designs include red or green gingham design tissue paper, small red hearts on white tissue paper, speckled raspberry or white tissue paper or plaid design tissue paper. You can never go wrong with our stripes designs such as classic black stripes on white tissue paper, black chevron on kraft tissue paper, or blue stripe on white tissue printed paper. The â€œperalesence" shiny tissue paper is one of the most shiny and exquisite tissue paper used for gift wrapping and packaging. The pearly shiny look on the tissue paper adds great elegance to the gift wrapping. Some of the most popular colors are antique gold, sun gold, white, copper, antique silver and bright turquoise shiny tissue paper. Most pearl shiny tissue paper comes in standard size sheets of 20" x 30" and packs of 200 sheets per pack. One of our unique and very popular offering in the printed tissue paper is Western themed tissue paper. The retail stores having old western style theme or cowboy style themes in their stores love this offering. Some of our popular designs include horse & foal print on tissue paper, lasso & horseshoe printed tissue paper and red brands western printed tissue paper. Even if you donâ€™t find the design on our site that perfectly matches your need, our sales representative are happy to help you. Call American Retail Supply if you have any questions or need assistance in placing an order 1-800-426-5708.